March came and went feeling much like it did last year with an average temperature of 32.1 degrees Fahrenheit and 166 growing degree days (GDD) above freezing, according to the Michigan State University Kalamazoo Enviroweather station. Having said that, year-to-date numbers had us a full 100 GDD behind where we were on March 31, 2018. The gorgeous April weather we've been enjoying has allowed us to catch up in a relatively short period of time with a year-to-date accumulation of 415 GDD above freezing as of April 11, 2019. Biological activity increases with temperature, which means that plants, insects and microbial communities are all growing at a faster rate. Spring is here again! Michigan greenhouses are firing on all cylinders right now. Depending on the operation, shipments to southern markets have been underway for several weeks. April can be an especially hectic time for greenhouses because even though they're shipping, the production doesn't stop; there is still a tremendous amount of plant material in every stage of production. In short, it’s a lively time with a lot of moving parts and I am continually amazed at how easy our growers make it look. Photo 1. 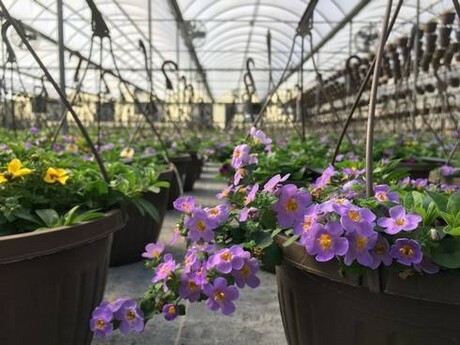 Lovely combination baskets in production at a Michigan commercial greenhouse. Photo by Jeremy Jubenville, MSU Extension. I'm pleased to report that nearly every crop I’ve seen looks beautiful. Overall, everyone is doing a great job with their nutrition management. Thinking back to last year, it was right about this time when we started to see an uptick in micronutrient deficiencies caused by high substrate pH. Much of the ground water in Michigan comes with naturally high levels of dissolved limestone components, also known as high alkalinity. Left untreated, irrigation water with high alkalinity will raise the pH of greenhouse container substrates over time. High substrate pH reduces the availability of several essential nutrients, which frequently results in chlorotic (yellow) upper foliage. Nutritional monitoring programs are a great way to significantly reduce the risk of pH-induced deficiencies and maintain the quality of our plants. Speaking of chlorotic foliage, plants with root and crown pathogens, such as Thielaviopsis and Phytopthora, are starting to show up in our diagnostics lab. Root diseases compromise the ability of the plant to acquire water and nutrients. This means the initial foliar symptoms can look very similar to those induced by true nutritional stress. So how do we tell the difference? How do we know if this is something we should be concerned about? Consider the context. Diseases tend to be patchy and randomly distributed throughout an area. Conversely, if all the plants in the crop are symptomatic, then the cause is more likely to be abiotic. Examine the roots. Healthy root systems tend to be light-colored and robust. Diseased root systems tend to be weak and dark brown or black in color. Submit a sample. Diagnostic laboratories are there to take the guesswork out of the equation. Early detection is critical for successful disease management. This is especially the case with pathogens like Thielaviopsis, which can be extremely difficult to eradicate once it has gotten a foothold in the greenhouse. Don't hesitate to contact a member of the Michigan State University Extension floriculture team if you suspect you're dealing with a disease. 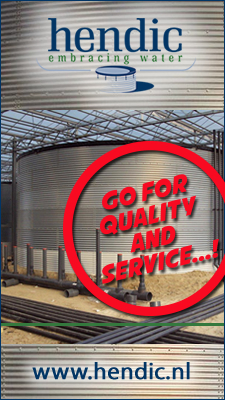 We can help submit samples and provide appropriate management recommendations. April is a critical month for thrips control. Flowers provide an additional source of nutrition in the form of pollen and nectar and this often translates into greater numbers of offspring. Warmer days also bring shorter life cycles, which means not only are female thrips making more babies, they're making them faster. Fun times! Keep a close eye on your sticky traps. Threshold numbers can vary depending on the crop and the grower's comfort level, but a good rule of thumb is to take corrective action when a weekly trap count reaches triple digits (i.e., 100-plus this per card). Aggressive action should also be taken when there is a sudden and large jump in weekly numbers. It's a very busy time now, but try not to postpone spray applications for too long. Waiting a week can have a tremendous impact on crop quality. Photo 2. Adult and immature life stages of the greenhouse whitefly (Trialeurodes vaporariorum) on woody perennial carryover in a greenhouse. Photo by Jeremy Jubenville, MSU Extension. Whiteflies are usually not much of a problem this time of year, but I've received a few reports of them in small numbers on Ipomoea, Vinca vine and Alternanthera. 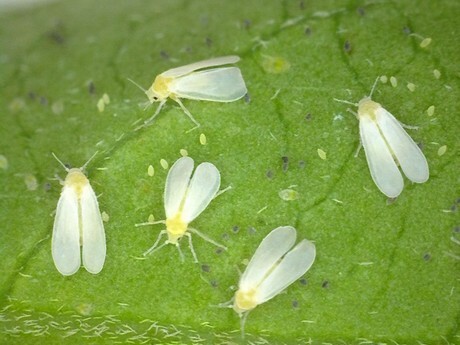 Early spring temperatures favor the greenhouse whitefly (Trialeurodes vaporariorum, Photo 2) over the heat-loving silverleaf whitefly (Bemesia tabaci). That being said, I have encountered several sizable infestations over the last few weeks, including a relatively rare Bemesia outbreak. In each case, the greenhouses had a retail garden center, harbored pet plants and retained carryovers from last season. It's not usually economical to keep unsold plants over the winter. Not only do they require maintenance, but they can easily become a resource for opportunistic plant pests. Scout pet plants and other carryovers on a regular basis and treat as necessary, otherwise we risk cultivating a home-grown population of insects just waiting to invade our beautiful spring crops. Depending what they're growing and how they're growing it, some greenhouses can go several seasons without a spider mite infestation. Outside of a few crops, such as Mandevilla and red Cordyline (where we expect to find spider mites every season), it's often anybody's guess whether they'll show up in the same crop in the same greenhouse as last year. Some of the latest finds have been in Alternanthera, Diascia, Ipomoea, zonal and ivy geraniums, vinca vine and Dracaena spikes. Until recently, I hadn't found broad mites in New Guinea Impatiens this year, but I suppose it was only a matter of time. They're still plaguing Rex, Iconia and Reiger begonias and I've seen some new infestations in Sunpatiens as well. Feel free to peruse the situation reports from January and February to see what we found in previous months. Conventional management product suggestions for all pests mentioned in this article can be found in the “Greenhouse Pest Management with Insecticides” sheet for 2019.